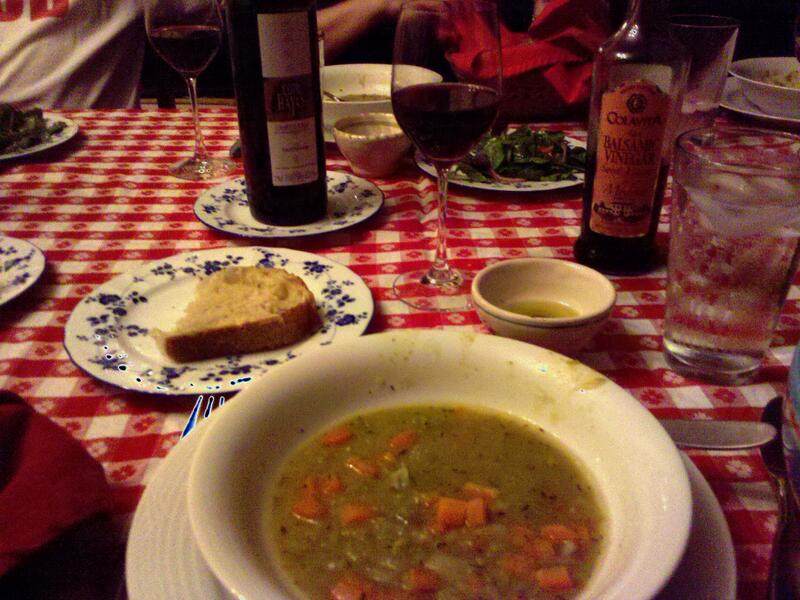 Some of our friends were returning from a ski trip to British Columbia yesterday, and we invited them for dinner. We weren’t sure exactly how many would be joining us, so I decided to make soup. A big pot of soup can feed any number of people. 🙂 I actually made 1½ times the recipe, so we had enough for 8 – 10 hearty appetites. 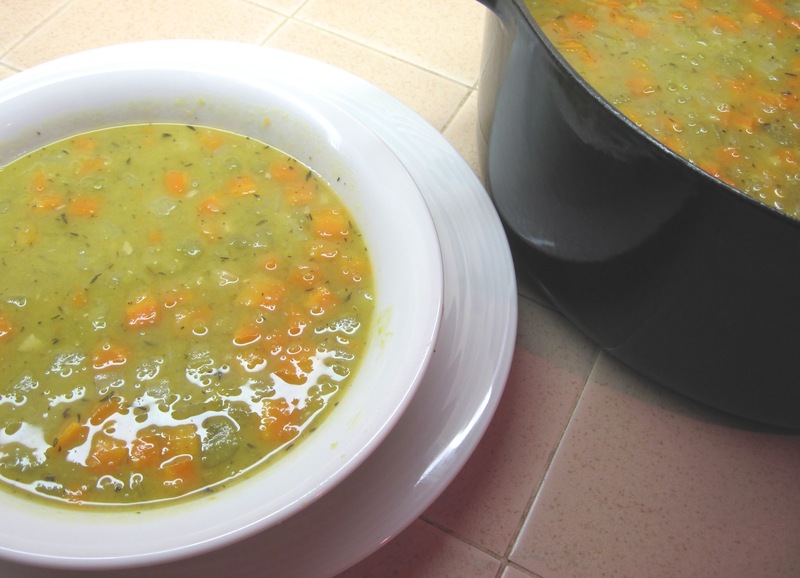 The Daily Soup Cookbook has a terrific recipe for Vegetarian Split Pea Soup. I like the way it turns out “soupy” and not as thick as some versions. And yet it is a perfectly filling meal with some bread and a salad. I have yet to find a good commercial vegetable broth, so if I wanted to truly make a vegetarian split pea soup I would probably make my own broth. Or I might try making it just with filtered water, increasing the salt a bit. This is an easy recipe to cut in half if you don’t want to make this much. 1. Melt the butter in a large pot over medium heat. 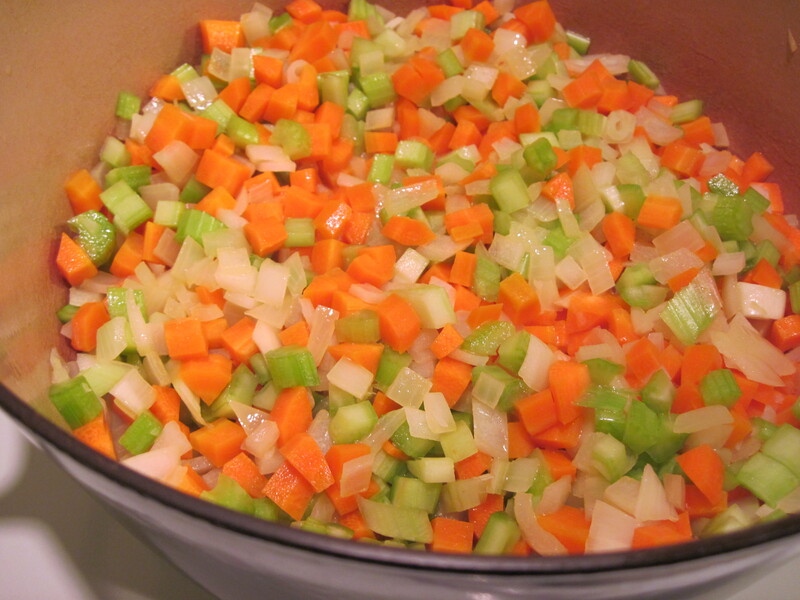 Add the onion, celery, and carrots and cook for about 5 minutes, stirring often, until tender. 2. Add the thyme, bay leaves, salt, and pepper and stir to coat the vegetables. 3. Add the split peas, broth and white wine. Bring to a boil; reduce heat and simmer, covered, for about 45 minutes until the peas are tender. 5. Add the minced garlic to the soup and simmer for 2 minutes. 6. Ladle the soup into bowls and top with chopped parsley. Have you tried Telma kosher soup cubes? They come in veggie, mushroom, chicken, and beef varieties and are quite acceptable as soup bases? 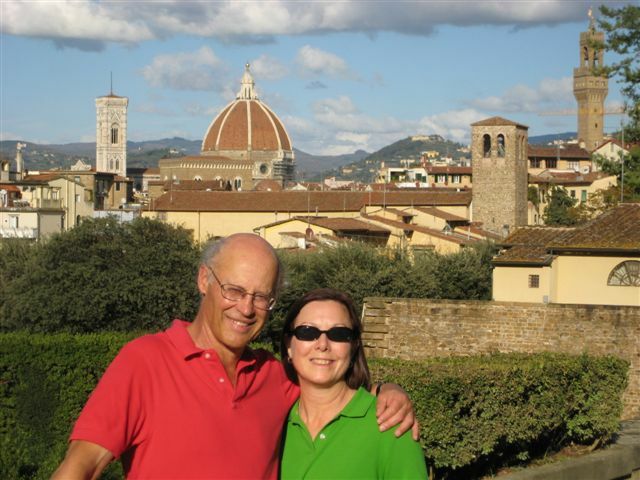 Thanks for your comment, Lonna! I haven’t tried Telma. I’m a label reader and I’m not crazy about the “Hydrogenated Palm Oil, Monosodium Glutamate, Disodium Inosinate, Disodium Guanylate, Trisodium Citrate” in their vegetable cubes. The Swanson Natural Goodness Chicken Broth: chicken stock, salt, flavoring, yeast extract, carrot juice concentrate, celery juice concentrate, onion juice concentrate. It’s not perfect (flavoring, yeast extract), but I do use it now and then.